The word “music” is a generic term and includes vocal and instrumental music. It occurs only one time in the New Testament. When the prodigal son returned home there was “music (sumphonia–ςυμφωνια), and dancing” (Luke 15:25). “Music” is generic and includes all kinds of musical sounds. This has no reference to a worship service, but to social activities in the home. If this one use of the word music authorizes instrumental music in worship to God, then it follows that dancing, killing the fatted calf, etc., would be included also. Since this is the only New Testament passage which uses the generic term music, and since it does not authorize instrumental music in worship, then instrumental music in worship is not to be found in this passage. Many denominations say much about instrumental music in worship, but instrumental music is not a New Testament teaching. Therefore instrumental music in worship is either based on the Old Testament, will worship (Colossians 2:23) or the traditions of men (Matthew 15:9). Any teaching that goes beyond the doctrine of Christ causes division (Romans 16:17). Instrumental music has caused division and therefore Paul condemned denominational division (1 Corinthians 1:10-13); and Christ condemned denominational worship (Matthew 15:9). “Speaking to yourselves in psalms and hymns and spiritual songs, singing and making melody in your heart to the Lord” (Ephesians 5:19). This has reference to congregational singing and neither to a choir nor some professional group, for they were to be speaking to themselves, which is a reciprocal action. They spoke to each other by singing and making melody in the heart to the Lord. Singing, therefore, is a doctrine of the New Testament. The church of Christ practices congregational singing; therefore, we are strictly within the bounds of the doctrine of Christ (2 John 9-11). In an effort to get around the New Testament teaching on singing, some say, “Jesus did not divide the scriptures into the Old Testament and New Testament, but man did.” They further teach that the Law (Five Books of Moses) was nailed to the cross, but not the rest of the Old Testament. They have the Law of Moses nailed to the cross, but would keep the Psalms and the Prophets in order to bring instrumental music into the worship of God. It is true that the Old Testament scriptures were divided into a threefold classification: the Law of Moses, the prophets, and the Psalms (Luke 24:44). But, to conclude that every time the word law is used it refers only to the Law of Moses; that is, the Pentateuch, is a great fallacy. Jesus said to the Jews, “Is it not written in your law, ‘I said, “You are gods” (John 10:34). This quotation from the Jews’ law is found in Psalms 82:6. Therefore, the word law here refers to the entire Old Testament, for the Psalms were not a part of the five books of Moses. Therefore, when Paul tells us the law was a schoolmaster to bring us to Christ and that we are no longer under that schoolmaster but under Christ, he meant that the entire collection of Old Testament books had been nailed to the cross (Galatians 3:24; Colossians 2:14). But is the criticism that man divided the scriptures into the Old and New Testament correct? Paul said to the Corinthians that he and the other apostles were ministers of the New Covenant: “Who also made us sufficient as ministers of the new covenant, not of the letter but of the Spirit; for the letter kills, but the Spirit gives life” (2 Corinthians 3:6). He also said that the Jews of his day were blinded in their minds because of a veil through which they were reading the Old Testament. “Therefore, since we have such hope, we use great boldness of speech—unlike Moses, who put a veil over his face so that the children of Israel could not look steadily at the end of what was passing away. But their minds were blinded. For until this day the same veil remains unlifted in the reading of the Old Testament, because the veil is taken away in Christ” (2 Corinthians 3:12-14). He also states that both the veil and the Old Testament were abolished or done away, in Christ (2 Corinthians 3:13-14). Therefore, no one living today can go back to the Old Testament law, which includes the books of Moses, the Prophets and the Psalms, to try to find authority for playing musical instruments in worship to God. 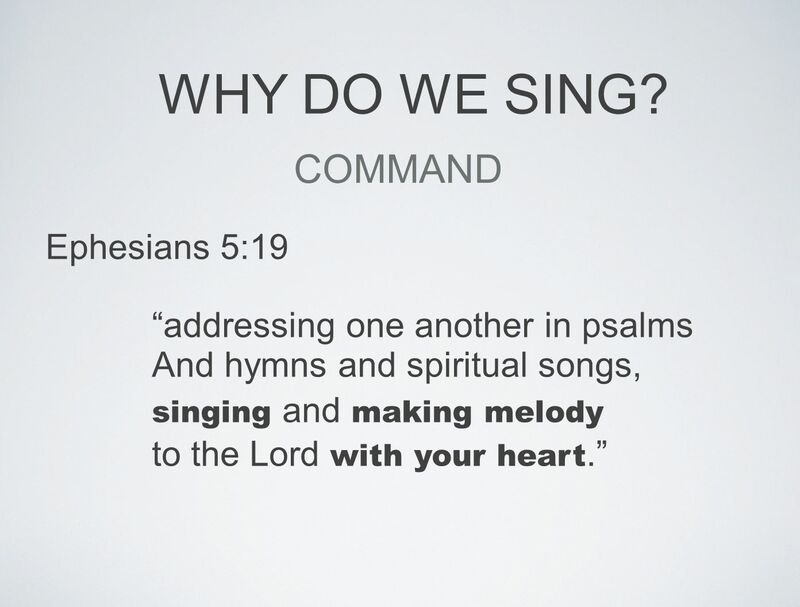 Singing—acappella—in the style of the church, was the practice of the New Testament church. Previous WHAT IS GOD’S NAME?